Warriors are strong and flexible, yet they are gentle. Learn how to be strong like a warrior and adopt their level of focus and concentration with this fabulous and easy to do yoga move. Stand straight on the yoga mat with feet erect and hands resting alongside the body. Let the head and shoulders be relaxed. Inhale and place your right leg backward, heels placed firmly on the ground. Bend your left knee in such a way that it is aligned atop the left ankle. Sink your hips down and adjust the body to bring into the center, balancing the weight equally on both legs. Inhale and lift your hands over the head. Exhale and tilt your head a little back, till you feel a tingle on your abdomen. Hold the pose, breathing deeply, for 5 deep breaths. Exhale, release your hands, and place your right foot forward. Take two normal rounds of breathing and relax. It is a good back and core strengthening yoga pose. It also improves the flexibility while bestowing you with better concentration and focus. It is a good pose for swimmers and athletes. Lower your right knee to the ground. Slide your right leg backward as much as possible or till you feel the stretch on your right thigh. Exhale and deepen the lunge by adjusting the knee. Inhale and lift your torso upright, lifting your arms over the head, aligned with the ears. Exhale and bend backward, until you feel the tingle on the core. Hold the pose breathing deeply for 5 deep breaths. Inhale, exhale, and place your palms down on either side of the left foot. Inhale, tuck the toes of your right foot and lift the right knee off the ground. Exhale and straighten your left leg. Inhale and place your right foot in the front in between your palms. Exhale and lift your body up and take a gentle backbend. 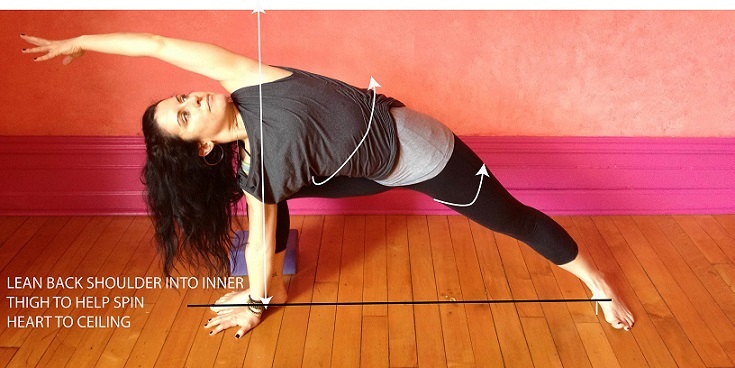 Give your energy levels a fabulous boost with this side stretch yoga pose. It massages your abdominal organs and strengthens it. Kids with regular tummy upset should practice this to avert such conditions. Plus, it boost the flexibility of the swimmers and tennis players too. Inhale and place your right foot in between your palms. Place your left heel firmly on the floor, your foot making a 45 degree angle with the mat. Bend the right knee in such a way that thigh is making a perpendicular with the floor. Inhale and lift your left hand up, fingertips facing towards the ceiling. Press the right hand firmly on the floor. Exhale and open the chest. Keep the hips squared and left shoulder aligned over the right. Fix the gaze on the left fingertips. Exhale and place the left palm near the right palm and extend your left right hand backward. Come back to Downward Dog Pose. Take three rounds of 3 deep breaths. Repeat the same with left foot in the front. Kids love to do this as it comes to them naturally. Just a little effort to keep the hips in position would make it more beneficial, bestowing them with an enhanced circulation level. An improved gush of blood to the brain will gift them with better concentration levels and memory, thereby enabling them to showcase a fabulous performance. 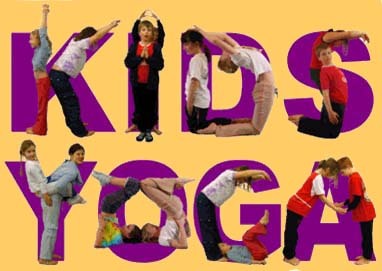 A wholesome and fun-filled way to ease stress, it could be one of the poses a child could practice to keep away the ‘trauma’ of exams. Stand straight on the yoga mat, feet close to each other, shoulders and neck relaxed, spine straight, and hands resting along your body with palms facing the thighs. Inhale and move your right leg back and turn towards your right side. The inner side of both feet should be facing each other. Engage your thigh muscles by drawing them up. Exhale and as you inhale and elongate your spine. Lift your hands over your head, aligned with the ears. Exhale and bend forward from the hips. Press your palm on the floor and keep leaning forward, while pushing the hips backward, until your torso makes a 180 degree angle with the floor. taking deep breaths, keep pushing your head down, torso parallel to the floor, and hips moving forward. Keeping doing this until the crown of your head touches the floor or you experience that tingle or extra stretch on the back of your thighs. You can use a block also to rest your head. Hold the pose continuing your deep breathing pattern for 10 deep breaths. Place your hands on your hips and exhale. Lift your torso off the floor and gently bend backward, keeping the legs in the same position. Inhale, come back to the centre, and join your feet. Release your arms to the sides of your body and come back to the starting posture. Relax with eyes closed. A very cute yoga posture, this is in fact one of the pose kids adopt while sleeping as babies. Have you not seen your baby sleeping on her knees with butts resting on the heels? Just look at the kind of peace that is spread across her face… Completely relaxed and at utmost peace…. That is what this pose is all about. Sit down on the mat, knees bent, allowing your buttocks to rest on your heels. Keep the feet flat, toes extended backward. Keep your spine erect, while head, neck, and shoulders are relaxed. Let your palms rest on the thighs. Inhale and separate your knees, pushing them outwards. Let the big toes be in contact. Exhale and fold forward, allowing your hands to rest on the floor. Keep the elbows, forearm, and palms on the floor, in front of you, while your buttocks still rest on the heels. Your tummy should rest on the thighs. Let your forehead rest on the floor. You can even stalk your palms and rest your forehead on that. Close your eyes and indulge in deep, clam breathing. Hold the posture as long as you want to. To release, exhale and lift your torso off the ground. Stretch your legs out one at a time. Breathe normally and shake out your legs.